HONG LEONG YAMAHA MOTOR officially launched, the long awaited Yamaha YZF-R25 to the Malaysian market, a 36hp parallel twin cylinder 250 cc engine. Yamaha YZF-R25 inherits the characteristics from high-powered output engine YZF-R1, combined with the lightweight and ease of use in daily life, the purpose of becoming an everyday rider, full range of performance and full of fun. New levels of the YZF-R25 will be in a segment B2 licence class which dominates the entry level supersports market. With the racing DNA in mind, fans of Valentino Rossi and Jorge Lorenzo can Revs their Heart with the new YZF-R25. Equipped with electronic injection YZF-R25 cooled parallel twin engine, after the latest analytic equipment designed the intake manifold, allowing the flow rate of the oil and gas mix optimization, to achieve better combustion efficiency, and further produce more horsepower. Cylinder using YAMAHA first used in the twin engine, developed their own die-cast aluminum silicon alloy (DiASil) cylinder, with forged pistons. DiASil cylinder with a lightweight, fast heat dissipation, temperature and other characteristics, can both performance and everyday use. Using lightweight tube just to reduce bending and welding parts, to achieve high rigidity, centralized focus performance, before and after weight 50:50, so the vehicle easier to grasp.Use within the same level of the maximum fork 41mm tube, the entire vehicle center of gravity to help focus the shock after a single gun, and the use of the YZF-R1 set the same ratio of wheelbase and rear asymmetrical rocker, perfect handling road feeling back. YZF-R25 with the same and using the neat rear lines, filled with DNA of the YZF system. YZF-R1 fairing design with the same multi- layered reverse angle design concept, in addition to both heat, rectification and other functions, but also increase the speed of its lines with visual sense.The YZF family features dual Predator headlamps, it is strengthened YZF family pedigree, in addition, including ultra turn light design with a central air intake, etc., can make people recognize that the bike is a member of the YZF family. 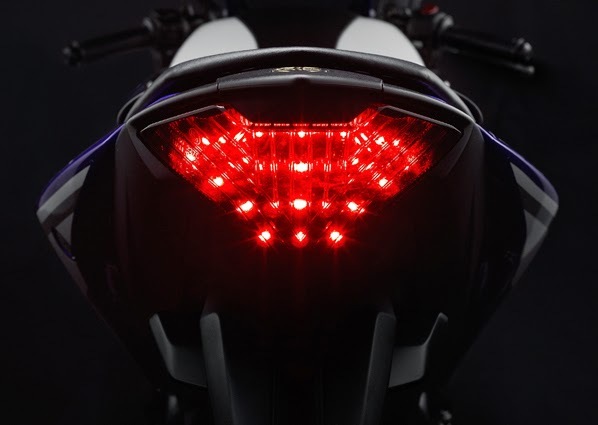 Double Predator Eye headlights and class triangle positioning lights, display characteristics YZF family. YAMAHA YZF-R25 At first glance, the tube rocker, steel frame, seemingly even lean but everything can not just appearance. R25 with twin 250cc engine has 36ps horsepower to play, definitely becoming the largest horsepower motorcycle in its class, also equipped with the inner fork tubes which are 41mm diameter, should give it a great handling. 12,000 RPM high to set the maximum horsepower, totally impossible for anyone to underestimate. Using a lightweight rim, effectively improve the R25’s handling. Tire size may be related to other Japanese sports bikes in the 250 cc segment, using the configuration front 110/70/17 and rear 140/70/17. Hong Leong Yamaha Motor will assemble the YZF-R25 locally as CKD unit and YZF-R25 price are estimated at RM19,999 subject to relevant approval. Mr Voon Yin Kong, General Manager, Sales & Markting HLYM, added that Hong Leong Yamaha Motors will be able to produce 300 units of YZF-R25 at its factory in Sg Buloh and expected to be in all Yamaha dealerships by the first week of April 2015. Yamaha YZF-R25 come is two colo ur variant. Blue and Red.